Dutch painter (also Zantvoort). He was a son of the painter Dirck Pietersz. Bontepaert and, on his mother s side, a grandson of Pieter Pietersz. and a great-grandson of Pieter Aertsen. His elder brother was the landscape painter Pieter Dircksz. 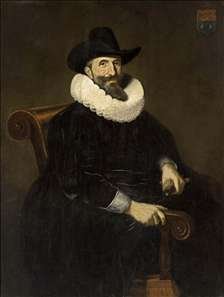 Santvoort (1603-35). Dirck probably received part of his training from his father, whose work no longer survives. The assertion that he also studied with Rembrandt has no factual basis, though he was undeniably influenced by the older artist. From around 1630 onwards the rapidly growing prosperity of Amsterdam created a strong demand for portraits and a profitable practice for specialist portrait painters such as Nicolaes Eliasz. Pickenoy and Thomas de Keyser, and of course, Rembrandt. In around 1635 Santvoort started as an independent portrait painter in his typical sober style. At that time he also became the foremost Amsterdam painter of childrens portraits. Although he lived to be nearly seventy years old, Santvoort s painting career, though prolific, only covers a period of about 10 years, from 1635 until 1645, when he seems to have given up painting altogether, since no later dated works by him are known. See more details about "Portrait of Elias van Cuelen"